humans have a ration of 1:35. - They live in groups of up to 500. 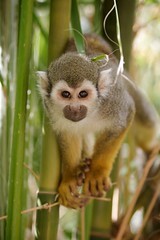 If I had to pick a monkey that best represents to people of Costa Rica I would have to go with the Squirrel Monkey. First of all they happen to be the smallest monkey in Costa Rica. Most Ticos happen to be not extremely large although with the arrival of Wendy's and other fast food chains this could change. When on a family vacation or traveling with your students I suggest taking the extra effort to try and see these monkeys. One sure bet is that they will make their way to the park of Manuel Antonio at 4pm everyday jumping ridiculous lengths and free falling to and grabbing onto branches the size of an eyelash. Another reason why I like to call this the Tico's monkey is that it is the most passive monkeys. I feel this is quite fitting for a country that doesnt have an army and for a country that has a reputation of the people being very peaceful and kind. Probably the most interesting fact about this monkey is that is that it is endangered. There are an estimated 1500 monkeys left in Costa Rica and this is the only area where these monkeys can be found making it endemic to Costa Rica. So if you have the chance to pass by Manuel Antonio make sure you pass by and visit a species that might not be along too much longer. We can hope that it is and their are associations doing much to help and if you want more information you can visit www.ascomoti.org.